ST. AUGUSTINE, Fla. (AP) — America’s oldest city is slowly drowning. St. Augustine’s centuries-old Spanish fortress & other national landmarks sit feet from the encroaching Atlantic, whose waters already flood the city’s narrow, brick-paved streets about 10 times a year — a problem worsening as sea levels rise. The city has long relied on tourism, but visitors to the fortress & Ponce de Leon’s mythical Fountain of Youth might someday have to wear waders at high tide. St. Augustine is 1 of many chronically flooded communities along Florida’s 1,200-mile coastline, and officials in these diverse places share a common concern: They’re afraid their buildings & economies will be further inundated by rising seas in just a couple of decades. The effects are a daily reality in much of Florida. Drinking water wells are fouled by seawater. Higher tides & storm surges make for more frequent road flooding from Jacksonville to Key West, & they’re overburdening aging flood-control systems. But the state has yet to offer a clear plan or coordination to address what local officials across Florida’s coast see as a slow-moving emergency. Republican Gov. Rick Scott is skeptical of man-made climate change & has put aside the task of preparing for sea level rise, an Associated Press review of 1000s of emails & documents pertaining to the state’s preparations for rising seas found. Despite warnings from water experts & climate scientists about risks to cities & drinking water, skepticism over sea level projections & climate change science has hampered planning efforts at all levels of government, the records showed. Florida’s environmental agencies under Scott have been downsized & retooled, making them less effective at coordinating sea level rise planning in the state, the documents showed. The issue presents a public works challenge that could cost billions here & nationwide. In the 3rd-most populous U.S. state, where most residents live near a coast, municipalities say they need statewide coordination & aid to prepare for the costly road ahead. 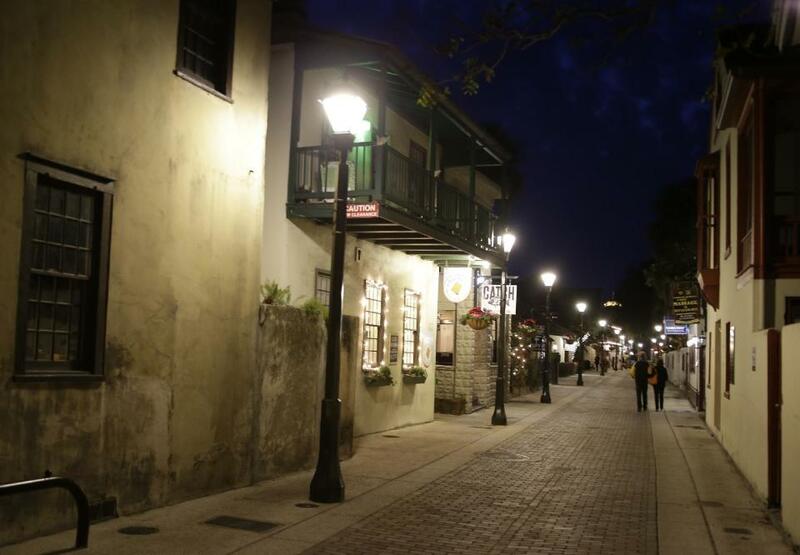 Communities like St. Augustine can do only so much alone. If 1 city builds a seawall, it might divert water to a neighbor. Cities also lack the technology, money & manpower to keep back the seas by themselves. In a brief interview w/the AP in March, Scott wouldn’t address whether the state had a long-range plan. He cited his support for Everglades restoration & some flood-control projects as progress but said cities & counties should contact environmental & water agencies to find answers — though Scott & a GOP-led legislature have slashed billions in funding from those agencies. Spokespeople for the water districts & other agencies disputed that cuts have affected their abilities to plan. “We will continue to make investments & find solutions to protect our environment & preserve Florida’s natural beauty for our future generations,” the governor said in a statement. Florida’s Department of Environmental Protection is in charge of protecting the state environment & water but has taken no official position on sea level rise, according to documents. DEP spokeswoman Lauren Engel said the agency’s strategy is to aid local communities & others through the state’s routine beach-nourishment & water-monitoring programs. In St. Augustine, downtown streets around 19th century buildings built by oil tycoon Henry Flagler often close during nor’easters bc of flooding. While the city’s proximity to the sea has always made flooding a problem, residents say it’s worsened over the past 15 to 20 years. St. Augustine’s civil engineer says that the low-lying village will probably need a New Orleans-style pumping system to keep water out — but that but no 1 knows exactly what to do & the state’s been unhelpful. Across coastal Florida, sea levels are rising faster than previously measured, according to federal estimates. In addition to more flooding at high tide, increasing sea levels also mean higher surges during tropical storms & hurricanes, & more inundation of drinking wells throughout Florida. Water quality is a big concern for many communities. It’s especially bad in South Florida — just north of Miami, Hallandale Beach has abandoned 6 of 8 drinking water wells bc of saltwater intrusion. Wells in northeast & central Florida are deemed at risk too. While South Florida water officials have led the charge in addressing sea level rise concerns in their area, their attempt to organize a statewide plan was met w/indifference, documents show. The Scott administration has organized just a few conference calls to coordinate local efforts, records show. Those came only after Florida’s water district managers asked DEP for help. In a recent visit to Everglades National Park, President Barack Obama said the wetlands, vital to Florida’s tourism economy & drinking-water supply, already are threatened by infusions of saltwater from rising seas. The list of other problems across the state is growing. Miami Beach is spending $400 million on new stormwater pumps to keep seawater from overwhelming an outdated sewer system. 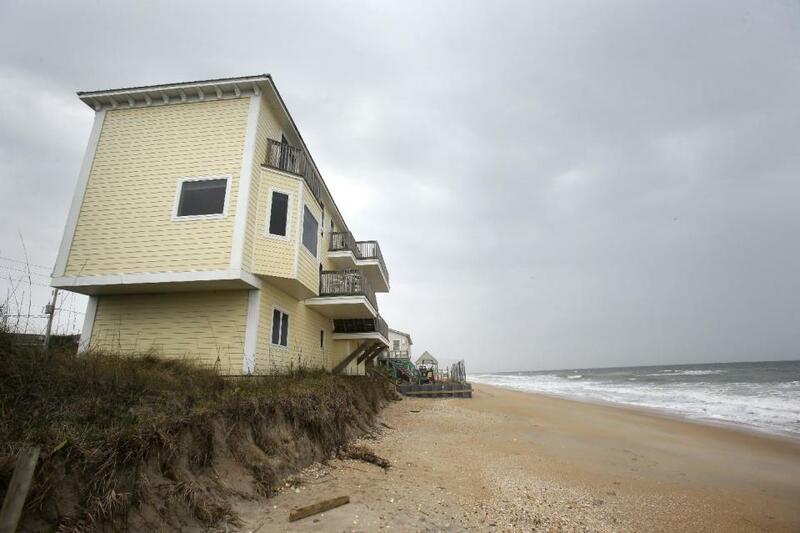 In St. Augustine, homes built on sand dunes teeter over open space as erosion eats at the foundations. Beachside hotel owners worry about their livelihoods. Tampa & Miami are particularly vulnerable to rising seas — many roads & bridges weren’t designed to handle higher tides, according to the National Climate Change Assessment. Officials say Daytona Beach roads, too, flood more often than in the 1990s. South Miami passed a resolution calling for South Florida to secede from the more conservative northern half of the state so it could deal w/climate change itself. Insurance giant Swiss Re has estimated that the economy in southeast Florida could sustain $33 billion in damage from rising seas & other climate-related damage in 2030, according to the Miami-Dade Sea Level Rise Task Force. Cities like St. Augustine have looked for help, but Scott’s disregard for climate change science has created a culture of fear among state employees, records show. The administration has been adamant that employees, including scientists, not “assign cause” in public statements about global warming or sea level rise, internal government emails show. For example, an April 28, 2014, email approving a DEP scientist’s request to participate in a National Geographic story came with a warning: “Approved. Make no claims as to cause … stay w/the research you are doing, of course,” the DEP manager, Pamela Phillips, warned. “I know the drill,” responded Mike Shirley, manager of the Guana Tolomato Matanzas National Estuarine Research Reserve near St. Augustine. Agency spokeswoman Engel said Phillips was a lower-level staffer whose views didn’t necessarily reflect the entire administration. When asked whether staffers are told not to assign cause, Scott’s office said “the allegations are not true”. Most towns say they cannot afford the cost of climate change studies or regional coordination. “For us, it’s a reality, it’s not a political issue,” said Courtney Barker, city manager of Satellite Beach. The town near Cape Canaveral used to flood during tropical weather, but now just a heavy rainstorm can make roads impassable for commuters. “When you have to listen to that mantra, ‘Climate change, is it real or not?’ you kind of chuckle, bc you see it,” Barker said. Scott administration officials are moving forward on a 5-year plan that will provide basic guidance to cities dealing w/sea level rise. Scott has appointed the Department of Economic Opportunity as the lead agency overseeing the project. The DEO has received nearly $1 million in federal grants for the plan. More than half has been spent on staff time & travel or hasn’t yet been allocated, according to documents. The rest, about $450,000, went to contract researchers who are helping create the document, due in 2016. Agency spokeswoman Jessica Sims wouldn’t comment & refused requests for the program’s manager to be interviewed. In 1 grant-funded study, Florida State University researchers asked local leaders about sea rise. Some officials complained to researchers about the “poisonous political atmosphere” over climate change hampering progress. The AP obtained the report in a public records request. “In some cases, especially at the local level, planners are constrained by perceptions among elected officials that there is a lack of reliable scientific information to support the existence of sea level rise,” report authors summarized. Scott’s office again said “the allegations are not true” when asked about the political atmosphere in government agencies. As for concerns over drinking water, water district officials said they were happy w/the state’s funding. But internal emails show frustration among those working behind the scenes to better organize a statewide sea level rise planning group. “I often worry about the next generations; I think they will survive in spite of us,” Dave DeWitt, a staffer at the Southwest Florida Water Management District, said in an email to colleagues. A district spokeswoman wouldn’t comment on policy beyond the district. St. Augustine officials say they need state-level coordination, or in coming decades much of historic downtown could be ankle-deep in water at high tide.